The raccoon inhabits northern America. Its most distinctive feature is the area of black fur around its eyes which contrasts sharply with the surrounding white face. This is known as a Domino facial mask, but it could be described as a bandit’s mask, which has enhanced their reputation for mischief. Known for their intelligence, they have the ability to resolve complex tasks and to recall the relevant solution years later. 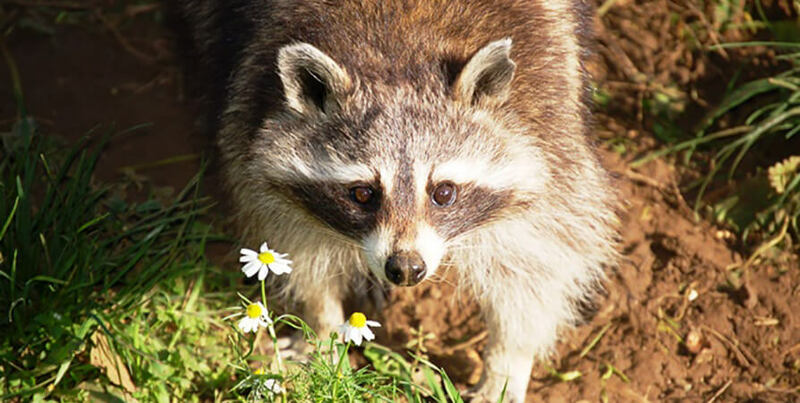 Habitat: The raccoon’s original habitats are deciduous and mixed forests, but given their adaptability they have extended their homes into coastal marshes, mountainous and urban areas. Following escapes and deliberate introduction in the mid-20th century, raccoons can now be found across Europe, the Caucasus region and in Japan. Lifespan: Life expectancy in the wild is only one and a half to three years, while those in captivity can live for more than 15 years. The raccoon’s gestation period is about 65 days, resulting in two to five young, born in the spring. Diet: The raccoon is nocturnal and tends to eat insects and worms, but it prefers fruits and nuts. They also eat birds and fish. Behaviour: Originally thought to be solitary creatures, evidence now shows that they engage in social behaviours. The females will often share a common area, while unrelated males will live together in groups of up to four.